Oh, silly BMW-Supra. You can try and disguise yourself all you want, but you know, deep down, that we see you. And you also know that you secretly love it, don’t you? Don’t you? You know you do. Man, the BMW-Toyota alliance is really showing these prototypes the grand tour—we’ve seen them in Italy, California, and... well, I guess it’s just Italy and California. But still. Also interesting to note is what appears to be a small camera mounted on the roof just above the B-pillar. Similar cameras have been seen on the roofs of other Supra mules and prototypes, like in the picture above, where the camera appears to be facing forward. What could these be for? Testing lane-departure/blind spot monitoring systems? Some semi-autonomous system tests? Simple documentation? We don’t really know. Also interesting to note is that the Supra does not appear to have a rear hatch, just a trunk lid. That’s a bit of a departure from previous Supras, which have always been hatchbacks, or, to use Toyota’s idiosyncratic term, liftbacks. 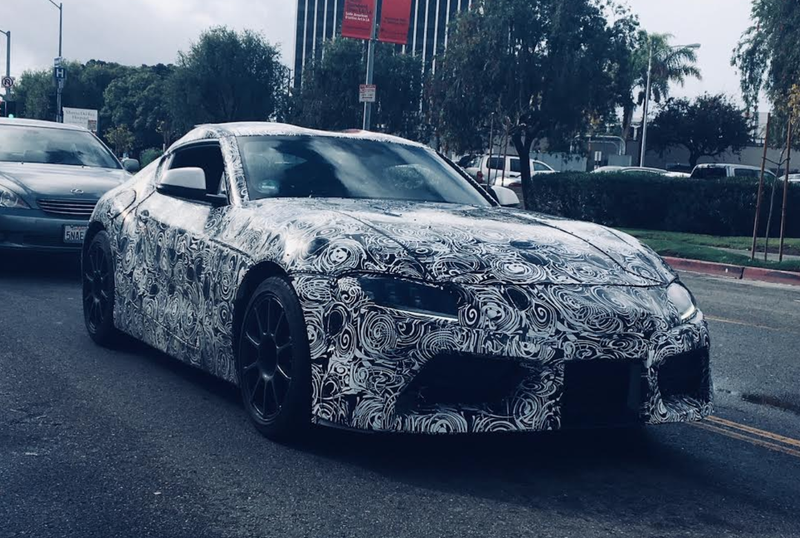 It’s always exciting to see the larval new Supra out and about. Well, if they actually call it the Supra. Which they better.